Cosmic dust or star dust has been floating all across space — either as scattered particles or in condensed rings. The rings usually form when dust grains are pulled into a planet’s orbit due to its gravitational force. It is even present in the corners of our homes, settling along bookshelves and fans — our planet receives nearly 40,000 tonnes of space dust every year. But where does this dust come from? Scientists believe that the cosmic dust is what’s left behind from asteroid or comet collisions, and can be traced back to collisions that happened during the big bang to the formation of galaxies and solar systems, including our own. By studying this dust, scientists can literally travel back in time to the very beginning and understand how matter formed and ultimately led to the origin of life on Earth. A popular belief is that planets came together as mere grains of dust — born out of giant disks of gas and dust that circle young stars. In this backdrop, two NASA studies gain importance — one which found evidence for a dust ring around the Sun in Mercury’s orbit; and another that identified the source of dust rings recently discovered in Venus’ orbit. In 2013, scientists confirmed a dust ring orbiting Venus — which turned out to be from a group of never-before-detected asteroids. Until then, it was believed that any dust near the Sun was likely to be coming from the asteroid belt between Mars and Jupiter, since this was the source of the giant dust ring in Earth’s orbit. “I think the most exciting thing about this result is it suggests a new population of asteroids that probably holds clues to how the solar system formed,” Marc Kuchner, one of the authors of the Venus study and astrophysicist at NASA’s Goddard Space Flight Center, said in a press note. Until the latest discoveries, it was believed that Sun’s heat would vaporise dust, sweeping the surrounding area clean. The two scientists, Guillermo Stenborg and Russell Howard, who found the dust ring near Mercury’s orbit were incidentally researching for such a dust-free space as part of NASA’s Parker Solar Probe research. Instead, they discovered a haze of cosmic dust near Mercury’s orbit — forming a ring that is around 9.3 million miles wide. 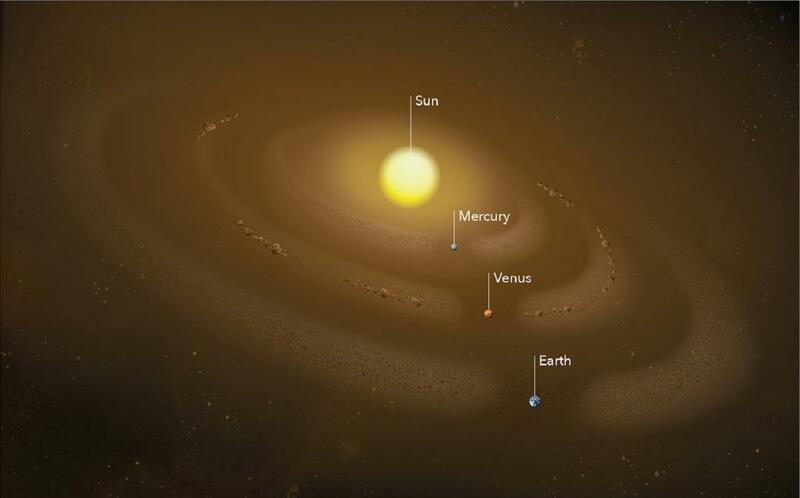 “People thought that Mercury, unlike Earth or Venus, is too small and too close to the Sun to capture a dust ring. They expected that the solar wind and magnetic forces from the Sun would blow any excess dust at Mercury’s orbit away,” Stenborg was quoted as saying. On the other hand, research into Venus’ dust ring suggests that the asteroids could have formed during the birth of our solar system, with some of them surviving till today. The findings add to potential detailed study of cosmic dust both in and outside of our solar system — to shed light on how life came into existence in the first place.